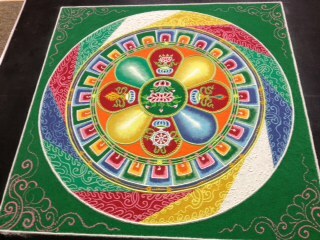 Photographs from the monks building a unique one-of-a-kind sand mandala. The mandala, which is an intricate work of art made from colored sand crystals, is both a physical work of art and a deeply spiritual activity. 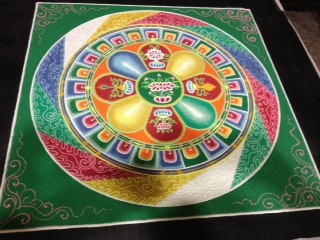 The mandala was on display for the Sunday morning services and as a meditation on impermanence the sand was brushed together and dispersed for placement in a body of running water to spread the blessings of the mandala.